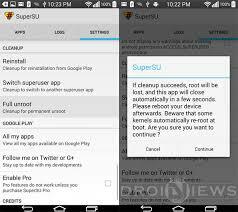 1>>Download and install SuperSU from the Link below. 2>>Launch SuperSU and go to the “Settings” tab. Scroll down until you see “Full unroot”. Tap it. 3>>You’ll be asked to confirm that you want to completely unroot your device – tap continue. Once done, SuperSU will close automatically. 5>>When your device has booted back up, uninstall SuperSU and you’ll be the proud owner of one completely unrooted Android device.